Just a quick post today, as a reminder that Google Reader is closing down on Monday. 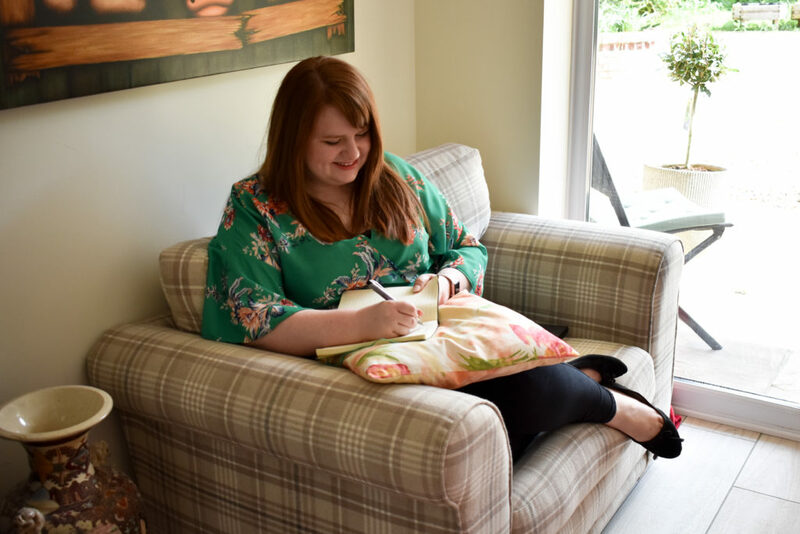 So if you’d like to continue following The Freelance Lifestyle, you can subscribe on Bloglovin’. You can also like the Facebook page , follow on Twitter, Google+ and YouTube. Thanks for reading this dull admin post. Here’s a video of a dog taking a puppy for a walk in a shopping trolley. p.s Have you entered the competition launched yesterday yet? 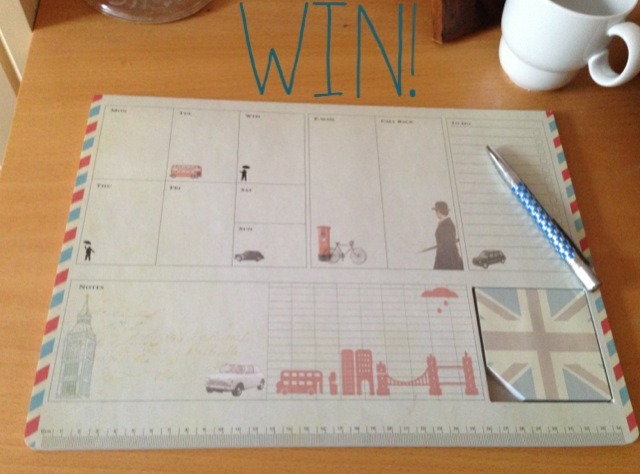 Today, I’m launching a little competition for those of you who love stationery and organisation in equal measures. While shopping in Paperchase recently, I came across this desk pad – and realised it was perfect for freelancing. 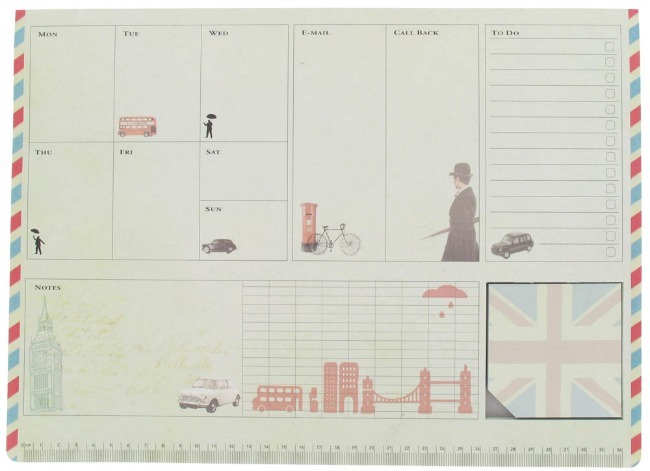 It’s got sections for your Monday to Sunday errands, email and call back notes, to do check list and general notes, plus a separate sticky note pad for notes on the go. You can fill in the planner, then tear the top one off when you’re finished at the end of the week to start again. There’s even a ruler at the bottom for er….well, it’s probably quite good for crafters actually. I’ve got a similar one in my office, for when I want to have my week all in one place. And now I’ve got one to give away. I’ve popped a Rafflecopter below with four options on how to enter – like the Freelance Lifestyle on Facebook, follow on Twitter or send a tweet. UK entries only I’m afraid. Competition closes on the 7th July. Disclaimer: I have bought this planner myself, and Paperchase has not had any involvement in this giveaway. Y’know, aside from making the planner in the first place. In just over a week, I’ll be on my way to Birmingham, to a place called The Custard Factory, to speak about social media, enjoy a picnic and chat to some of the most exciting bloggers in the UK. The bloggers who are in the line up all make an income from blogging, so you’ll get great advice you can really put into practice. Did I mention there will be a picnic? In a place called The Custard Factory? The really awesome bit is, tickets are just £20. D’ya know what else you can buy for £20? One cinema ticket for a two hour film. And maybe a nasty hot dog. Three magazines. Maybe four if you like the ‘My grandmother was also my mother’ type of weeklies. A great networking experience with likeminded people. Most of the tickets have now gone, but there are a few left. You can snap them up on the Blognix event page. If you can’t make it, you can follow the #Blognix hashtag on Twitter for the latest updates. 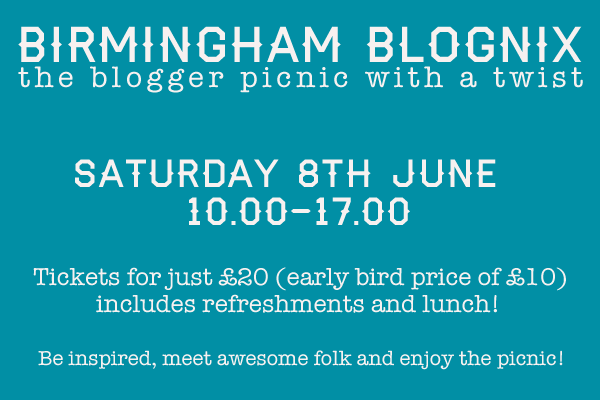 So, who’s coming to Blognix? Did you know a lot of freelancers started out doing bits and pieces in their free time, around their full-time jobs, families and other responsibilities? 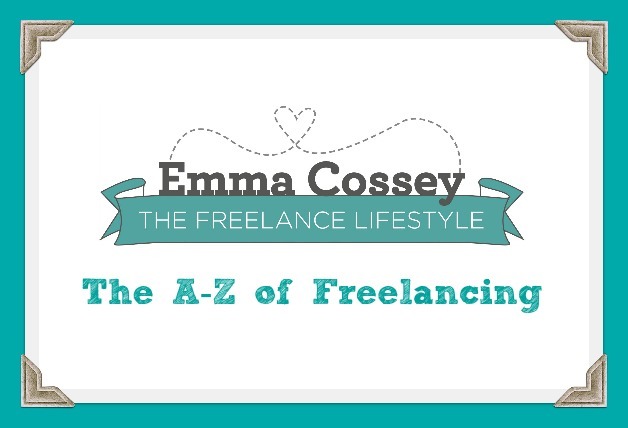 Taking the plunge into full time freelancing can be, well…..terrifying! But free time freelancing is totally doable, and a great way to test the waters. Virtual assistant – admin generally. Renting – You can rent out anything, from items you own to your home for filming! When you want to find freelance work, but don’t have the time or money to promote yourself or network, there are plenty of tools you can use. Fiverr – This task marketplace lets you offer a small service for $5. This is a great way to make a small amount of money while building up your portfolio. People Per Hour – Another bidding marketplace, People Per Hour can be useful for picking up the odd job you can do during the evening or at the weekends. I occasionally pick up writing work through PPH, so it’s worth signing up for. Task Squad – I wrote recently about Task Squad. If you’re 18-25, you can do ad hoc jobs through Task Squad, ranging from public stunts to event supervision. Get your friends involved. 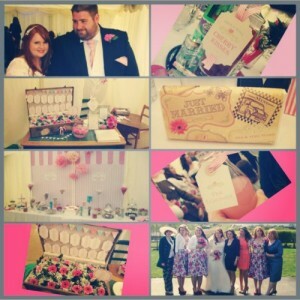 Do you offer a service like baking, sewing, graphic design or child/pet care? Ask your friends to keep their ears open for any potential opportunities. Get social. Creating a Facebook page for your work is a great way to promote your product or service, with no costs and little time commitment. One of the important things when considering free time freelancing, is working out how much time you want to dedicate to it. While it might be tempting to fill your free time with extra work to earn extra money, you’re not doing yourself any favours. Try to keep at least a couple of evenings or a day at the weekend free from work, so you have a chance to recharge. You might also want to check your contract, as some employers prefer that you don’t do the same work for other clients, especially if they’re possible competitors. 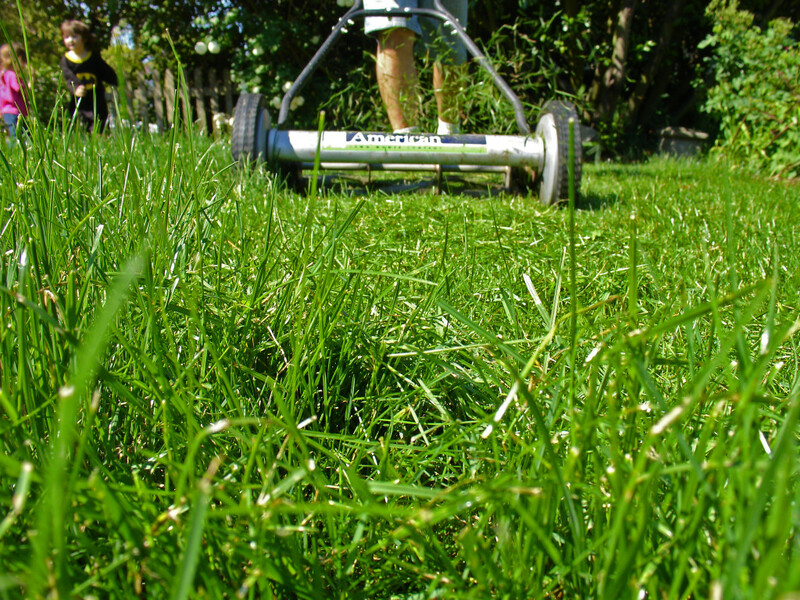 Are you tempted to do some free time freelancing? 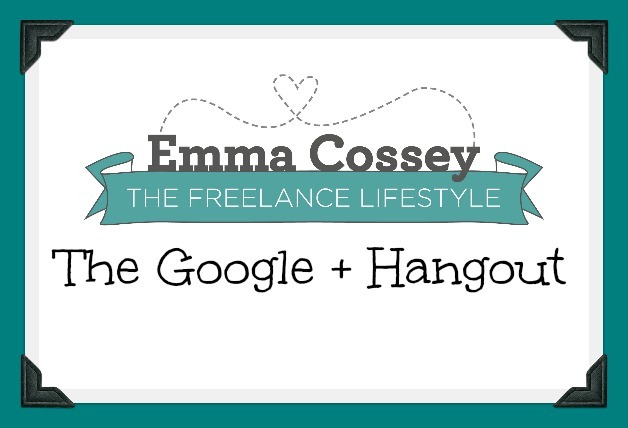 This morning, after a couple of technical difficulties, I managed to have a great hangout with the lovely Rosie from One Man Band Accounting. We discussed a topic that I think a lot of you might find interesting – freelance marketplaces. Sites like Elance, People Per Hour and Fiverr, where you can bid on jobs or project against freelancers all over the world. Want to know what we thought? Hit the play button below to watch our hangout (30 mins)! What to look out for if you’re hiring. Do you use freelance marketplaces? What do you think about them? Let me know in the comments below! A lot of freelancers I know, myself included, have a reputation for being surgically attached to their smartphones. The beauty and curse of being freelance is that you’re never far from a couple of taps from work. 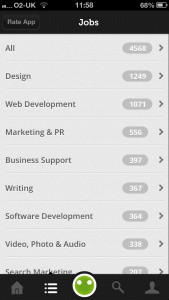 I’m not entirely sure how I’d even manage my business without my trusty iPhone, and the bundle of apps on it. When it comes to apps, I have a LOT on my phone. There are a few in particular that are great for maintaining a great freelance lifestyle. Pomodoro – Struggling to concentrate? 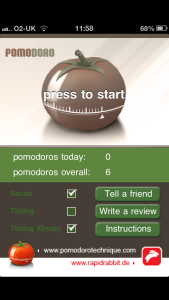 Pomodoro is an app based on the popular Pomodoro productivity method. Set the timer for 20 minutes, then focus entirely on the task in hand. In fact, I’m using it right now to write this! Mailbox – The latest mail app on the block, this is an amazing app if you use Gmail. 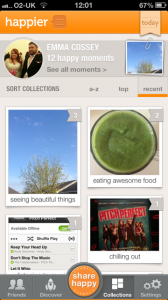 With a couple of swipes, you can delete, archive, file or schedule a reminder for later. A vital tool for hitting Inbox Zero. 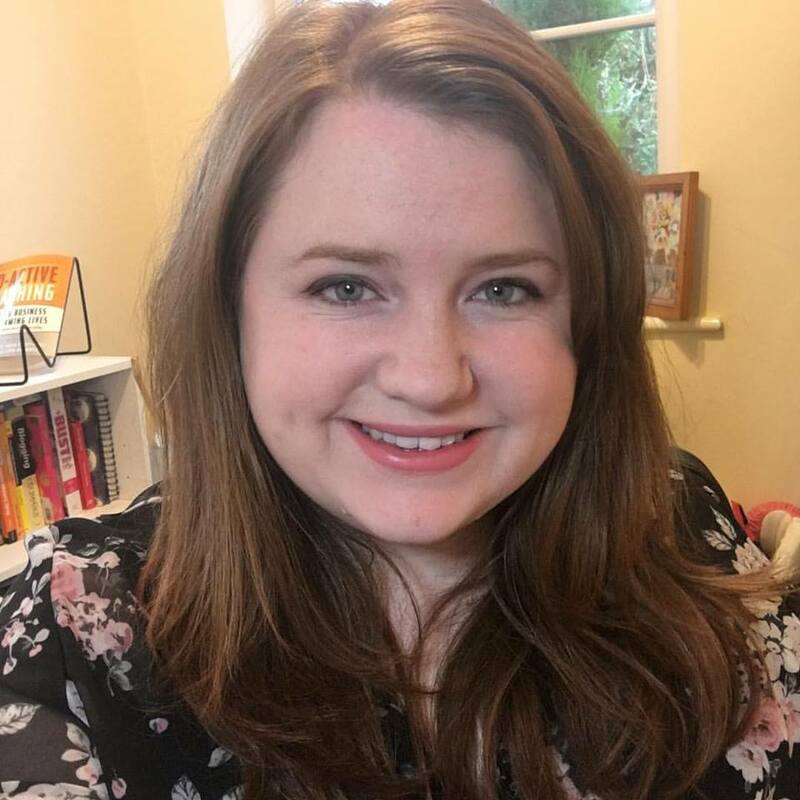 Bloglovin’ – Now Feedburner has announced its closure, a lot of people have jumped over to BlogLovin’. I’m still mainly using Flipboard, but I really like Bloglovin’ for finding new and interesting blogs. Podcasts – I listen to a lot of podcasts while I work, and Podcasts is my go-to app for subscribing and listening to them. They’ve recently added a function to create playlists of subscriptions – so I can have my meditation podcasts in one list, comedy in another and lifestyle ones in another. Hootsuite – For tweeting on the go, Hootsuite is a must-have. I look after several different accounts at one time, so Hootsuite is brilliant for this. Plus the scheduling comes in handy. Wunderlist – I make dozens of To Do lists, which is why I love Wunderlist. Freelancers tend to spin several plates at once, so Wunderlist is great for keeping track of several projects and what needs to be done. PeoplePerHour – The People Per Hour app works with the site to enable you to bid on jobs or tasks on the site. I often use this to browse late at night, so I can bid before others. Journey Pro – Freelancing and travelling goes hand in hand. While I prefer to stick close to home, when I do need to go out I like to use Journey Pro, to plan my journey from start to finish. Particularly handy in London, where I always get lost. GridDiary – This simple, but rather gorgeous-looking, app asks you a few questions at the end of each day. Questions cover who you’ve met, what you’ve achieved, what you’ve done for family and how you felt the day went. It’s basically a mini journal. When life passes so quickly, it’s handy to have an app that lets you take note of the little, important things. 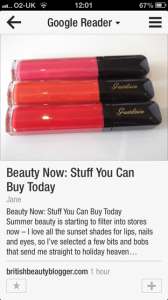 Flipboard – Ah, the app iPads were made for. This is usually one of the first apps I open in the morning, to catch up on my social networks, RSS feeds, Instagram and YouTube. It turns all of these into a magazine style format, so you can flip through it while having your breakfast. You can also now create your own Flipboard magazines of content that others can subscribe to. SatNav2/Skobbler – I’ve tried many sat navs on the iPhone and iPad. Google and Apple’s map apps have both failed me since the latest update, but SatNav 2 is consistently brilliant. I also really like Waze, which is user-driven – like a sat nav social network. Spotify – Every freelancer needs a soundtrack to their day. Spotify lets me stream music quickly and easily – but it’s the collaborative element I love. I have a couple of shared playlists with other freelancers, filled with music to cheer us up, get us knuckling down or chilling out on a Friday afternoon. Mailchimp – When it comes to newsletter tools, Mailchimp is an easy favourite. While the Mailchimp app doesn’t let me create newsletters (yet…? ), I can view reports for opening rates, click rates etc. Audible – Regular readers will know I’m a huge fan of the audiobook marketplace Audible. Until recently, the app has been a little disappointing, but a recent update has made it easier to listen to audiobooks and track how long you’ve spent listening to them. My only complaint is that you still can’t browse and download audiobooks from the app. IM+ Pro – Skype and Google Chat are my versions of the office water cooler. I don’t tend to use Skype that often for video, but it’s great for text chat – plus it’s easy to look back on previous conversations. Lift – An app to help create and stick to habits, whether it be hitting Inbox Zero by the end of the night or necking a green smoothie in the morning. Calm.com – I’ve got a bunch of meditation podcasts and app on my iPhone, but Calm.com is my current favourite. It’s super simple – choose a background scene and sound, then relax as the app talks you through a meditation session. It’s great if, like me, you’re not really into the spiritual “ommmmmmm” side of things. Happier – Well, this is a little slice of joy. In my ongoing quest to be more mindful and appreciative, I was recommended this app for sharing daily happy moments. It challenges you to share three happy things each day, with an optional photo. It’s social (what isn’t these days? ), so you can view and like other people’s happy moments too. Sometimes, us freelancers are a modest bunch, so it’s nice to have a place to share what things have made us happy. What apps do you use all the time for freelancing?